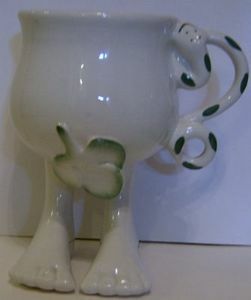 This is one of a series of 'Special' releases from Carlton Ware in their 'Walking Ware' series produced in the 1970/80s. This one was created as one of a pair - 'Adam & Eve' both of which are available on this site. This one is, evidently, 'Adam'. It has a snake handle and large bare feet with a suitably placed fig leaf at the front. The behind of the figurine/cup is bare and flushed pink. It is slightly larger than the 'Eve' cup. Designed by Roger Michell (Lustre Pottery) for Carlton Ware, this particular cup is highly collectable as there are not too many around now. The overall height of the Cup is 4.75 inches (12 cms). It is in excellent condition and is appropriately backstamped on one foot.